These treatment plants consists of two 8-ft.-dia. 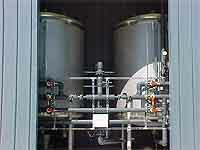 stainless steel filter vessels containing the manufacture's patented Media G2 arsenic adsorption media. The plants meet all the requirements of the bottled water industry: the media is certified to NSF Standard 61, it does not alter the chemistry of the water in any way (other than arsenic removal), and is in compliance with FDA regulations. The plants are reducing arsenic to less than 2 ppb (i.e. below even the pending revised EPA limit of 5 ppb). Maintenance is minimal, limited to an occasional brief backwash to remove accumulated particulates. ADI International, 2518 Plantation Center Drive, Suite A, Matthews, NC 28105. Tel: 704-845-1540; Fax: 704-845-1539.